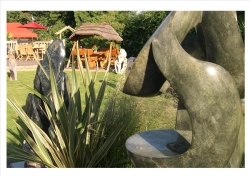 After ten years of collecting Chique Afrique now have the largest selection of Stone Sculpture in the North of England. 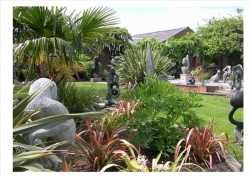 The Sculptures are exhibited within the grounds of the property, in a variety of different settings, and can be viewed at the monthly Open Days. Also, If you know you are visiting the area and wish to visit, just give them a call in advance to make arrangements. Most of the Sculptures are Abstract, Contemporary or Spiritual pieces, but they do have a small number of Animal sculptures and birdbaths available each year. 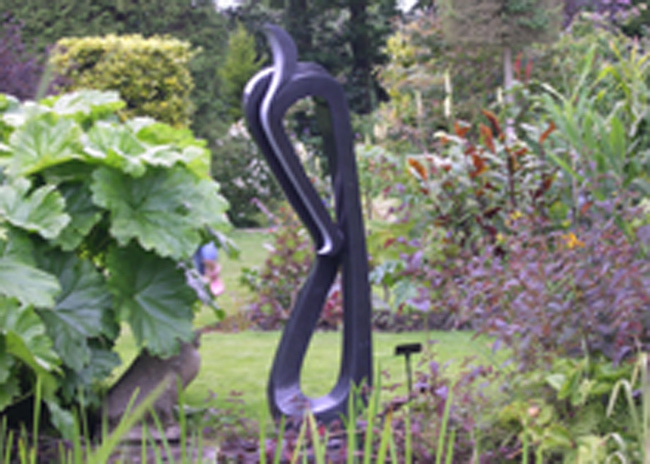 The Garden Sculptures range in price, depending on the stone type, design, size and most importantly the name of the Artist who created the piece. As Chique Afrique only purchase directly from each Artist and then sell directly to you, the client, all sculptures are uniquely, affordable, which is why they have so many regular visitors. Chique Afrique, is unique in that they offer an installation and delivery service for their sculptures. They are also happy to advise on water features and up-lighting options to maximise the impact of your purchase. Chique Afrique always finishes each season with a number of Christmas Fairs, in Cheshire and Derbyshire, but if you wish to visit the interior showroom for a special present, then please give them a call. Bespoke Stone Sculptures can be commissioned, just give them a call to discuss the process!